Annapurna: like the mountain itself, the name is ancient and fascinating. In Sanskrit, “ana” means “full” and “purna”, being an old word for rice, is translated as “food”. The appropriate interpretation is, therefore, The Great Nourisher, residing on the swelling rich mountain formations, like a motherly bestower of divine plenty. The divinity of mountains is a universal archetype in human cultures, more present here than anywhere else, where the mountain summits are respected and even worshipped as sacred. Even the numerous hikers and climbers that are drawn to the Himalayan peaks bear witness to a kind of mountain worship. In its foothills and forested slopes, Annapurna feeds the villagers who, twice a year, harvest rice and millet from their meticulously constructed terraces. Higher up, Annapurna feeds the souls of visitors from all over the world, climbing hillsides and ridges, glaciers and rock faces, on a strange pilgrimage towards icy and lofty regions. Trekkers, hikers, tourists and climbers – but pilgrims none the less – consciously or not. Most visitors are happy with just seeing the mountains in a morning epiphany or as they suddenly reveal themselves through layered clouds. The joy of looking and taking pictures seems obvious enough and demands neither explanations nor excuses. Others are lured higher up, and through their excruciating and risky effort, facing death, climbers are forced to ask themselves more sincerely what draws them up there. What exactly is the relationship between the mountains and the soul? Trekking on the Himalaya is an uplifting and at the same time humbling experience. As with all great things, the question is no longer if the experience lives up to your expectations, but if your appreciation lives up to your experience. Behind the real mountain is the mountain as a symbol, and behind the symbol is the living meaning of the vertical, the ascent and the summit – as these matters speak to our imagination. The ascent, whether actual or imagined, is an image of transcendence and self-overcoming. The panorama as a divine experience: “pan-horama” – a view of everything. Like their invisible counterparts among the Hindu gods and goddesses, these holy mountains have both a nurturing and a deadly aspect and demand the visitor’s respect. The Annapurna range is termed a sanctuary, and by that is meant not only nature protected by the people, but also protected from the people and protected by the gods. Consequently visitors are encouraged to respect the mountain also for the concern of their own safety. The attitude sums up the careful combination of spirituality and eco-tourism, a hallmark of Nepal’s high-altitude trekking industry. Keeping the trekking sustainable and in peaceful coexistence with village life is a vital concern in Nepal’s management of mountain enthusiasts. Thus, Annapurna can keep feeding both body and soul of both declared and undeclared devotees of the holy mountains. The basic tenant of all plein air painting is that the painting should be born from the landscape itself – as immediately as possible. When we talk about “immediacy” as something worth striving for in art, we are implicitly saying that oftentimes the mediation stands in the way and limits our perception. There is, however, always a medium – even if this medium is our senses and our conception of what we sense. To paint from nature is an exercise in sensation. Between the landscape and the painting stands the painter with his senses – so the painter, more than the paint, is the medium: both the means and the limitation. For the landscape to be reborn as a painting, its myriads of features have to be sensed, selected, compared, translated, divided and reassembled into hundreds or even thousands of individual brush-strokes. Before the eyes of the painter, the unified impression of the surroundings crack up into a legion of separate problems and challenges. Every observation consequently turns out to be just preliminary. As the gaze digs into the landscape there is always more to see. 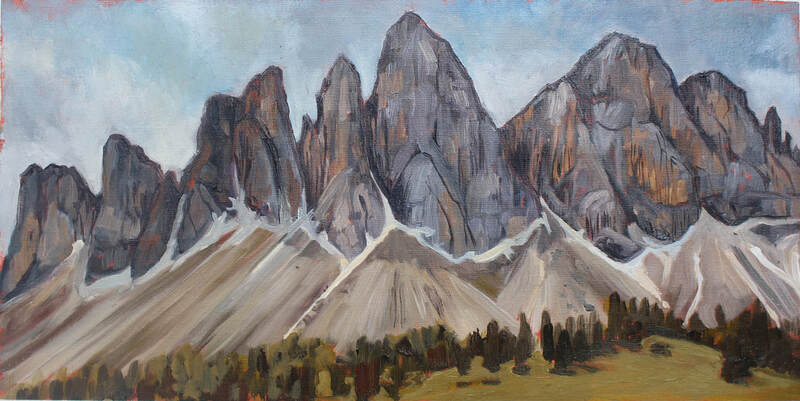 Accordingly, plein air painting is to realize the bottomless depth and infinite nuances of the vista. Thus, getting lost in it all, one risks losing the immediate impression of wholeness, and one has to pull back to the general features – to big planes, hues and general lines. The painting is born through a weaving together of simplifications and complexifications of the perceived landscape. When one takes a snapshot, even the picture taken yet has to be seen – and often it never really is perceived or contemplated. A plein air painting, however coarse, is always something perceived, always the result of a contemplation. A little like the climber who is called upon to justify his unreasonable efforts, the painter could be asked what is, after all, the purpose of the mountain painting. The answer might be: in order to have a living relation to something that enlivens the spirit by its greatness. Mountains are Great. Tall. Old. We cannot fully possess them, so we remain possessed by them. Words are poor and the best you can say is that you have to see it yourself. And then when you do, it still feels like it’s more than you can fully take in or grasp – which is precisely how Kant understands the experience of the sublime. Painting the mountain is another way of trying and failing to possess the mountain – and thereby staying in touch with it. The mountain is in itself the product of contrary forces. Pitching the upward trust of the layered rocks against the merciless pull of gravity, the Himalayan mountain range is like a frozen battlefield. In fact, one could see it as an ongoing battle, taking place with a magnificent slowness. The features of the mountains bear witness to the play of these monumental, but in themselves imperceptible, forces. The cracks and fissures, the lines, planes and angles have a rhythm whose logic slowly makes itself evident to the watchful eye. Though the mountain may slowly erode, its monumental materiality makes it an image of permanence. Our vision of it is, however, is as changing and transient as ourselves. As the light changes, different features are brought to the fore, while others are diminished, even seem to disappear. For a moment, after sunrise, the colours of the rock is glowing in their shades of yellow and red – and just a little later the rocks all seem uniform. With the sun at a certain angle, one can distinguish the snow from the ice – and just after, it’s all blindingly white. Interplaying colours of wet and dry rock is soon lost to the sun, while black shadows eats into the electric glow of a glacier. The sunlight itself takes full possession of the shapes at sunset, transforming the manifold cliffs to one burning iconic image. The most precious moments might last for just a few minutes – just after the sun sets or before the fog settles. 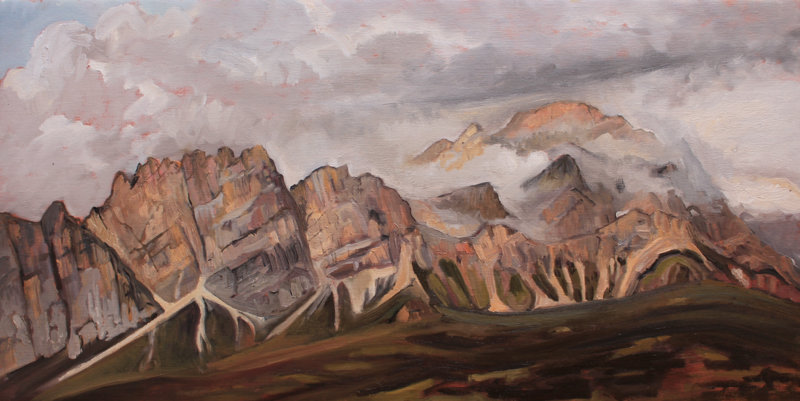 Painting in the Himalayan mountains is as obsessively exciting as unpredictable. It opens one’s attention to the richness of the landscape, to the preciousness of the moment and the swiftness of change. 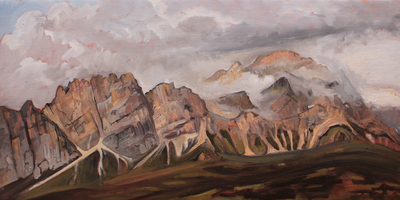 This attempt to capture some figments of all this and to recreate some brief visions of Annapurna becomes my personal painted ode. 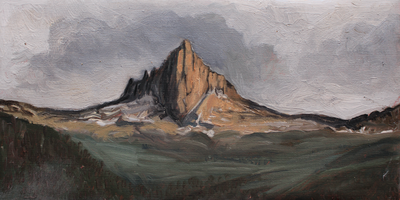 As, for a moment, the brush strokes could make Annapurna reverberate: the felt mountain, the seen mountain, the painted mountain - and the real peak out there.